Do you have an idea of the battery life on this sensor ? Why not change to 1MHz to allow the voltage to go down to 1.9 or 1.8 V ? Expected duration more than 2 years for the CR2032 and about 3.5 with the two AA (power consumption less than 5uA during sleep time; measured using a uCurrent Gold). I measure the power consumption when working at 1 MHz and there was no difference between 1 or 8 MHz. As I have to decrease the transmission speed at 1 MHz, I got some issues. The main was probably with the signing feature. @carlierd you cannot compare the behavior of AA batteries and CR2032. Button cells have a high internal resistance, you can't draw much current from them else the voltage drops very quickly. The more current you draw the more you lose in heat because of this internal resistance, the solution is to use a big capacitor to provide the current, then you lose energy because capacitor has a current leak, but usually it's better than what you lose with internal resistance. Maybe your 100uF is doing that job if data sending is quick enough, but at 8MHz and the voltage drop when sending you might already be very close to brown out level (or crash level if you have disabled brown out), you should check the voltage just after sending and not before to have an idea. I will check in few weeks the result. There is several capacitors to help the stability maybe it could be enough. If it's not the case I will replace the CR2032 by 2 * AAA. @Nca78 you can have brownout if the battery is near end of life and nothing has been designed to handle a bit the internal res. but with a fresh a coincell and some capa, you can do some chain tx but that's not the best for the battery life. capa ideally calculated/estimated (on mine I have 200uF, plus others for sensors, radio is 86uA etc..) and after multiple msg presentation on frsh coincell i don't fall under 2.85 (voltage starts 3.05V) because I can't recover voltage during this period. For the capa leakage, it depends of capa. common good quality ceramic have not those leakage (few nano). Sure on this design it's not a ceramic. You're right at runtime 1Mhz consumes less than 8Mhz; mA vs thousands uA. But at 1Mhz everything is slower, comms too (I mean code execution). During deep sleep, there is no difference in power consumption. Oscillator is stopped so mhz does not mean. Note: at 8Mhz you can wake in few uA, at 1Mhz it's slower of course. I wonder whether a higher capacity coincell, like maybe a CR2450 (620mah) or a CR2477 (1000mah capacity), might give you the pulse current you need without needing a capacitor, thus avoiding leakage losses? Plus maybe you wouldn't need to change it as often. sure 2450/77 would be better. 2477 is a bit expensive. but not sure if those coincell would be better without capacitor (I mean in the long term), looking at coincells datasheets.. which are always given for x kohms load. leakage current for ceramic common quality capacitor is in nA range (hopefully), so i think it's better to have it buffering to help the coincell (still for the long term, or at a momemt it won't be enough strong). if alka, there would no need..
@scalz : I missed your reply ! Interesting withe paper ! @carlierd yep, this doc inspired me too, plus coincell datasheets,. I use mega-pile for sourcing batt and they have lot of battery datasheet. How did you source the probe portion of the sensor? Yes. Do you have one in mind? Historically, one problem with PCB probes has been that over time water intrudes into the PCB and throws off the calibration. Not sure if there's a solution for that problem, though it seems like one should exist. As an aside, people seem happy with the Vegetronix probe, up until its PCB suffers water intrusion. The asking price is rather high though. If I knew how to, I'd make one of those and simply waterproof it better. For the best results, running the square wave at 80Mhz or faster seems to be important. That's what vegetronix does. Now, the good news is that the clock on an ESP8266 can supply that frequency.. However, all this analog circuitry is beyond my purview, so I inevitably hit a wall with that. Is that something you (or someone reading this) knows how to do? For instance, I don't know whether the chirp guy's circuit that you linked to works as-is at 80Mhz, or whether it requires modification. If the latter, that's where I get stuck not knowing what to do. None of his calculations make reference to frequency, so maybe (?) you could hook up the circuit to 80Mhz and it would "just work." I suppose the switching speed of those transistors might be a factor. I have no insight into that, but it would probably be easy for someone to test. IIRC, the higher frequency makes a capacitive soil moisture sensor much less influenced by soil characteristics other than moisture, so it's really necessary to have that in order to make a good probe. So with that, you could just use a regular humidity sensor inside it to judge soil moisture. Pretty cool, yes? Not sure how big it is, but maybe you could even fit your entire sensor node inside it. One of the local shops I buy electronic parts from has those. Unfortunately it's too small to house an entire sensor. It's better to use high freq for a reliable soil moisture, regarding soils, calibration etc. and some studies argues even more than 200Mhz. but with 80-100 it's nice. I have one design at this freq, non corrosive design, and not same as chirp though, but can't really help you (mine is not open yet, and busy on others projects). Regarding the chirp design, I think it may need an opamp for better results regarding the 1M resistor etc, and some more tuning if going high freq. Trying to get this working but getting alot of errors. New to this so bear with me. I have looked through the code but can't seem to see what is wrong with it. @simbic did you modify the sketch in any way? If so, could you please post it? My guess would be an incomplete #define or using incompatible versions. Which version of MySensors are you using? I have assembled a copy of @carlierd 's office plant monitor since it looked kinda neat. When I first tried to upload @carlierd 's Moisture_sensor.ino it complained that several libraries were missing. So I started google-fu around to find them. The code is as follows. I have only pressed include mysensors' library since it complained that it was missing. * Code and idea from mfalkvidd (http://forum.mysensors.org/user/mfalkvidd). //The change was large, so it was probably not caused by the difference in internal pull-ups. //Measure again, this time with reversed polarity. I have just installed Arduino IDE, and are using the latest mysensors library 2.1.1.
aswell as built the sensor from there. If you can help, I would be very glad, as I just hoped it would be smooth sailing using mysensors. Build, upload and let it work its magic. @simbic that sketch is made for MySensors 1.x so it won't work with MySensors 2.x. Perhaps one of those might be big enough? Or, if not, perhaps it could be joined onto a larger waterproof cavity, and just the sensor itself goes into it? Unfortunately for me, the parts appear to be metric. However, maybe a search would yield some kind of metric-to-imperial union, at which point I could then leverage cheap local parts from Home Depot or the like, to fabricate a larger cavity for the rest of a wireless mote. On the face of it, it seems plausible. It's main virtue is simplicity. Not sure what the failure modes are, or how they might be avoided if there are any. Plainly, you don't want to use components which might rust or otherwise corrode from humidity. Probably my biggest worry would be the possibility of condensate forming on the humidity sensor and skewing results until it evaporated. However, a sensor heater, such as some sensors (e.g. 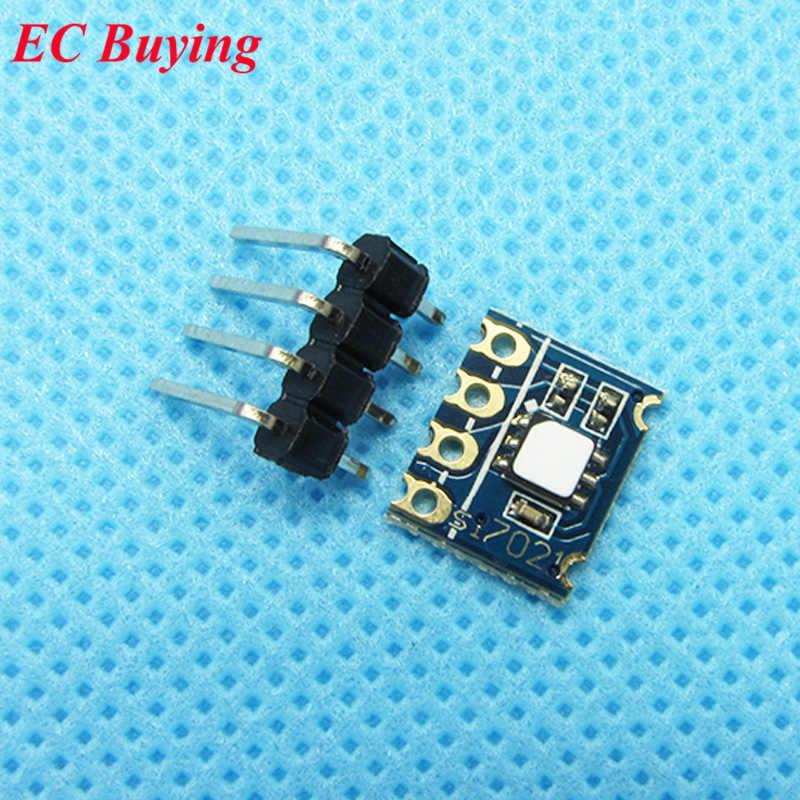 si7021: https://www.aliexpress.com/item/Industrial-High-Precision-Si7021-Humidity-Sensor-with-I2C-Interface-for-Arduino/32524005324.html?spm=a2g0s.13010208.99999999.350.t9NHvJ ) already have, might remedy that if it were to occur. Has anyone tried either one of the above or anything similar? For instance, perhaps wrapping a mote in Tyvek and sealing the seam with Dupont housewrap tape would work just as well. @NeverDie they are all very small inside (5-6mm) so are only suitable for very thin PCB with SMD version of the sensor, even the breakout of si7021 that you linked is too big. "The model shown in this link is too small for I2C boards, but seller has much larger models. L-04 has 12.8mm opening, L-06 has 17 mm and L-10 has 23mm opening." The seller says I can buy 3 of the 1" diameter units at $5/pc. The communication with the seller is like playing 20 questions, but I only get to ask one question at a time, with typically one day turnaround for an answer. If I ask more than one question per interaction, he doesn't really answer any of them. So, getting truly meaningful answers is a slow process. Well, for small potted plants, you might have to re-pot the plant. However, the nice benefit that would arise is: no visible sensors, which carries with it very high WAF.